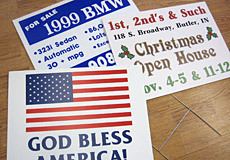 Yard signs are great and affordable way to get your message out quickly. 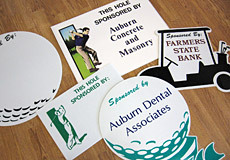 Ideal for short term, Sign Pro' yard signs solutions are great for businesses, golf outings, school spirit , parties and more. 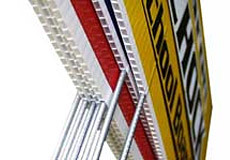 With different sizes, shapes, colors and materials, there are many options available to you. Stadard Size: 18" x 24"
What a great way to show off your sponsors help. Also great for identifying a contest hole. Great for teams or individuals. Show your spirit with one of our many options.